This week I heard two things that prompted me to write this post. Two of my blogging friends, Two Fat Expats, here in Doha were talking about an article on a popular Australian website; that will remain nameless. The article was talking about that expats have this amazing life and we get everything done for us by our companies and that we are stars in the foreign countries we live in. While there is some truth to the statement, most of it is far from the truth. Another thing I heard this week was that someone asked my Mom if I actually worked! I was slightly embarrassed by this question, and I have no idea of the tone the question was asked in, so I can’t judge. I can see why this person asked this because if you look at my personal Facebook account or the one for my blog, I am usually posting pictures from vacation or a work trip. 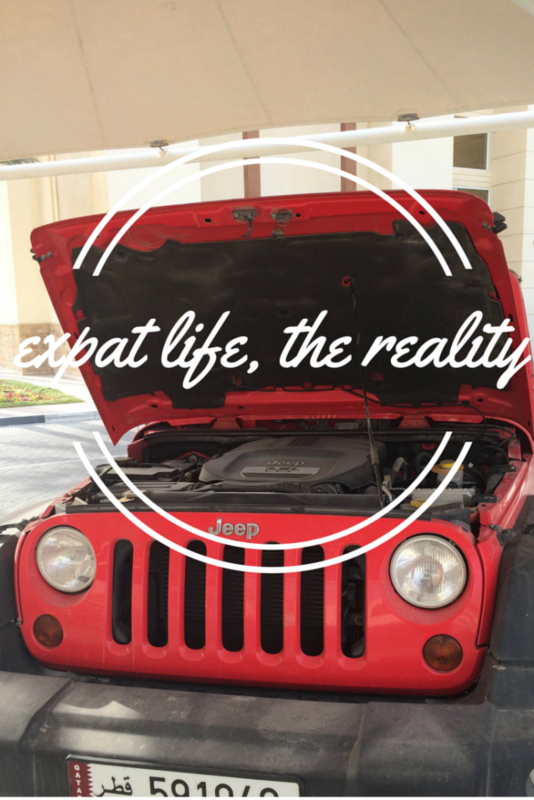 It can seem very glamorous, but I am going to talk abou the reality of expat life. Some other Qatar blogger friends also said that they would like to see more of my personal life on the blog. This is an attempt to show you what expat life in Qatar is actually like for me. Not sure how much I will do, but here we go! Yes, I work! This makes me laugh a little because I wouldn’t be able to be here otherwise. Qatar has strict resident requirements that you have to meet to be here. For most, this means working. Some are here under the sponsorship of someone who is working. Qatar or my employer, depending on how you look at it, controls my leaving the country. We all have to have exit permits to leave. I have a yearly exit permit, but some people have to ask for it every time. This can make it difficult to go as you have to ask for the exit permit a few days before you go and hope that your employer agrees for your already paid for trip. The exit permit is supposed to be going to a different system, but I am not sure when or if it will happen. But you are always traveling! It may seem that way, but I am really not. Because I work at a university, I have more vacation that most Americans do. I get the equivalent of about a calendar month off a year. I manage to combine those with holidays and university closings to travel several times a year and go home for Christmas. Some trips are also working trips. Like last month’s trip to Slovenia. I even mentioned that in my post. Research is a part of my job requirement and so is presenting my research. Keep in mind that I space out blog posts about trip specifically because of this reason of not traveling all the time. This is the tricky part to talk about. Yes, I do make more money here than I did at home and we are given a travel allowance that is supposed to be used to go home once a year. Because I am single, I am able to use that money to go home and to travel. I still look for airfare sales and good hotel deals, though. I am not living it up at the Four Seasons when I travel! The hotel I stayed in for my last night in Slovenia, which was on my dime, was $34 a night! There is a downside that many expats don’t talk about because people are always saying how great our lives are. It is also because we don’t want to be seen as complainers since we should have nothing to complain about. So here are a few things that can make living in Qatar difficult for me. I say me because these may not annoy everyone. Keep in mind these are all minor things and not reasons to leave. We all have issues with places we live. Not picking out my own furniture – I live in furnished accommodation, which sounds great and to some degree it is. The apartment is large and has four toilets! However, I wasn’t able to pick the furniture, mattress included and it was used. My mattress was so bad; it gave me shoulder bursitis. Also, everyone’s furniture is the same in the whole building! Gas stations are few and far between – And you aren’t allowed to pump your own gas. Since the stations are so far apart, there are lines at almost every station and the one near my house blocks my way to work. Recently it has gotten so bad; I started going a different way. This also takes me past a gas station but seems to be less crazy than the other one. No self-car washing – In what I assume is an effort to control water waste; there are no self-service car washes. Again lots of lines ensue! I have waited over two hours to get my car washed and I could have done it in 30 minutes. Produce doesn’t last – Eat the berries before you leave the store! Okay so maybe within a day or two. It took them forever to get here and in the summer that sat in the sun for a while before they made it to the store. You do not want to eat moldy berries, trust me! No Benedryl or Alka Seltzer – Medication is heavily regulated so for some reason we don’t have these at all! And pharmacies are not located inside grocery stores, so there is another trip to you have to make. Most grocery stores are in malls! I hated grocery shopping and malls before I got here, so even more UGH! No left turns – Okay not no left turns, but very few. This means it takes longer than it should to get most places and lots of u-turns. Like when I go to the pharmacy! No petite sized clothes – This perplexes me to no end! Many Qatari women are short and most everyone else is Asian, so not tall either and yet, we have no petites anywhere! Last night, I went on a long mission to a tailor to get pants hemmed and ended when I discovered the building had been torn down at some point. Last, but not least and probably #1, No Street Signs – Well none that anyone actually uses! Lots of streets have names, but none of us has addresses! When I tell people where I live, I tell them by the closest hotel and mall! We do not get mail delivery in the traditional sense either. I really wanted to title this post, Where Streets Have No Name! Anyone who gets that song reference and has made it far into this long post gets a prize from Qatar! I could go on, but then I would be complaining! There are definitely things about my life here that are easier as well. I have a housekeeper that comes every two weeks to clean the title floors, which I hate doing, but so do many of my friends and family back home. As a woman, you are sometimes allowed to go first in line at places and many salons and areas of restaurants are women only. Qatar is incredibly safe and I feel comfortable going out alone at any time of the day or night. Best of all, Rome is a 6-hour flight away! Is there anything about my expat life you want to know about, but are afraid to ask! Go ahead, I don’t bite. Ask me anything you like in the comments. I was fascinated reading this blog post. I love your candor. Your life seems like the life you are living right now. I do wonder if you will eventually want to move someplace else after you retire? But for now, it sounds like a different experience that some may wish they were living. Maybe not there, but anywhere the grass appears to be greener. Ugh! If people could only do the research before making assumptions, or just use common sense that would be wonderful. Thank you for taking your precious time to explain it all. I wouldn’t feel like I had to. It does make for a most interesting post though. Much appreciated! Thank you. I am so glad you enjoyed it. I am sure I will move before I retire. I can’t retire here anyway since I am not a citizen. Yes, the grass is greener for a lot of people. Me too! Thanks for stopping by! Hi there. thanks for the post and certainly an insight into aspects of expat life here. 1. Loneliness – I arrived here in 2007 knowing two people (one of whom was my boss) and that’s it. Those first four weeks were among the most lonely of my life. Even now with a great circle of friends and a relationship with a wonderful man, I still feel that occasional sting of isolation. I know many do. 2. Distance from family. My mother died in July last year and even with the luxury of being able to be with her, coming back to Doha was one of the hardest and longest journeys I have ever made. I choose to live here but that doesn’t lessen that feeling. 3. Job insecurity. I have had four jobs in nine years – been fired, been made redundant, started my own business then took an in-house job. On each of those transitions, I felt very vulnerable and alone. I remember trying to explain to my father the “process” of changing sponsors and he was baffled. 4. Transient relationships. It’s fair to say that I have seen friends come and go here. You say you will keep in touch but that is hard even with social media. I’m very lucky to have a good, solid tribe around me and a man, but we all know because of the vagaries of life here that could change in an afternoon. 5. Disparities. Let’s face it, you can’t ignore them. My building watchman earns QR700 a month and lives in a shack on the roof of my building. He hasn’t been back to Nepal for three years. I regularly spend that much on a night out. I do what I can to help those in my life but the disparities are hard to ignore. I’ve probably got a few more, but I wanted to add these to your list. Thanks for the post and keep writing! Hi, Rachel! Thank you for your very thoughtful and personal comment. You are a Doha veteran! Yes, there are negatives. I agree with you on all points! My only thing is that I was lonely when I lived in the states even though I had plenty of great friends. I think it is my need for change that causes it.I am so sorry about your Mom. Even being able to go home doesn’t help. Loss is hard no matter where you are, I am sure. You have really weathered the storm here if you have had the strength to stay after being fired and made redundant! Good for you. It is so hard to know that there are people here making much less than you and there is so little you can do. They are also some of the nicest and friendliest people in Doha. Thank you for the encouragement! I really appreciate you stopping by. Ah, but what is the difference between an expat and an immigrant? Technically nothing. However, many people do make that distinction mostly on economic reasons. Unfortunately it is a class distinction that shouldn’t exist anymore. Thank you! I would also say that all immigrants are expats, but not all expats are immigrants. For example, I cannot immigrate to Qatar and become a citizen. I think Qatar is similar to KSA when it comes to the need to have exit permit or visas and yes a bit conservative than UAE. Thank you. It is like a cross between the two.